Cream Cheese Pesto Dip is one of the easiest dips you will ever make! 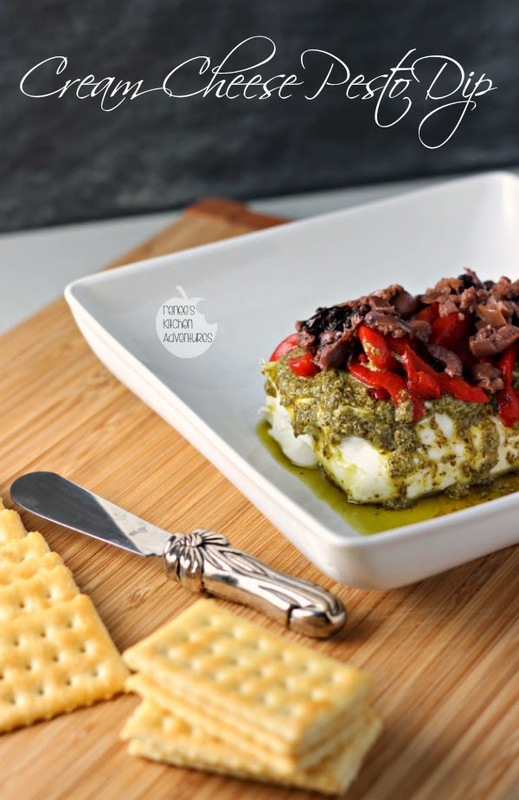 Reduced Fat Cream Cheese is topped with pesto, roasted red peppers, and chopped olives in this festive dip, perfect for all those last minute parties and gatherings! Happy December 1st! I can't believe this year is almost over, and that it is time once again for the Secret Recipe Club reveal! This month, I was assigned to the blog BCMom's Kitchen. I had so much fun looking over all the wonderful recipes on this site, and let me tell you, there are a ton! I was delighted to find a recipe I could make to use the ground lamb I have in the freezer with Lamb and Barley Stew and the recipe for a delicious looking Quick and Easy Burrito Skillet caught my eye, but I ultimately decided to make the Cream Cheese Pesto Dip, because it reminded me of the festive colors of the season and I LOVE pesto! This lovely looking appetizer could not be any easier! In fact, there really are no measurements, just use as much of each ingredient as you like. I decided to put my own twist on it by swapping out the feta for chopped Kalamata olives and the tomatoes for sliced roasted red peppers. As BCMom states, it can be served warm, cold or even at room temperature. I loved it at room temperature best! Because there are so few ingredients, make sure you use premium products in this appetizer for best results! I used a pesto I purchased over the summer in Chicago, when I had the chance to shop at Eataly. It really made this appetizer something special. This is such a great recipe to have on hand during this busy season, because it's so pretty and tasty, but can be thrown together in no time for any occasion! 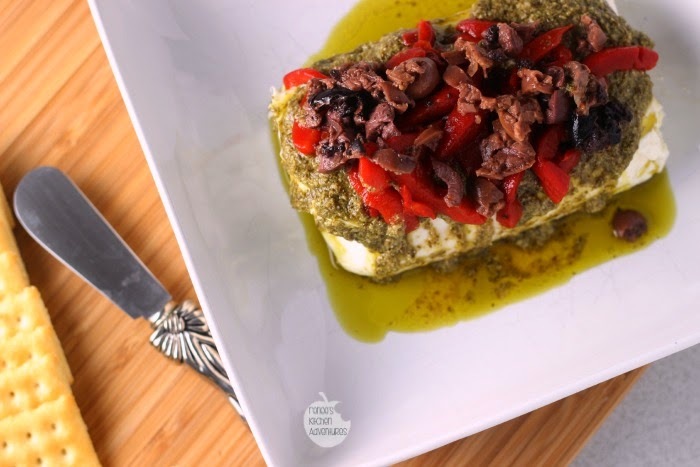 Reduced Fat Cream Cheese is topped with pesto, roasted red peppers, and chopped olives in this festive dip, perfect for all those last minute parties and gatherings! In a shallow bowl or dish with sides, layer all ingredients, using as much as you like of the garlic, pesto, red peppers, and olives. You can heat this up in the microwave for a few seconds to soften the cream cheese, serve it at room temperature, or serve it cold with your favorite crackers. We love this dip! I'm glad you liked it, and now that you've brought it up, I really need to make it soon. I may have to try the olives. They look great on it. Lovely and the perfect way to kick off any holiday party. Love this combo! This actually sounds delish! I am going to have to give it a try at my next get together! What a perfect dish for this time of year. Even just the cream cheese and pesto on its own sounds delicious! I typically see a sweet jam atop a brick of cream cheese, so I like this savory version as something new. 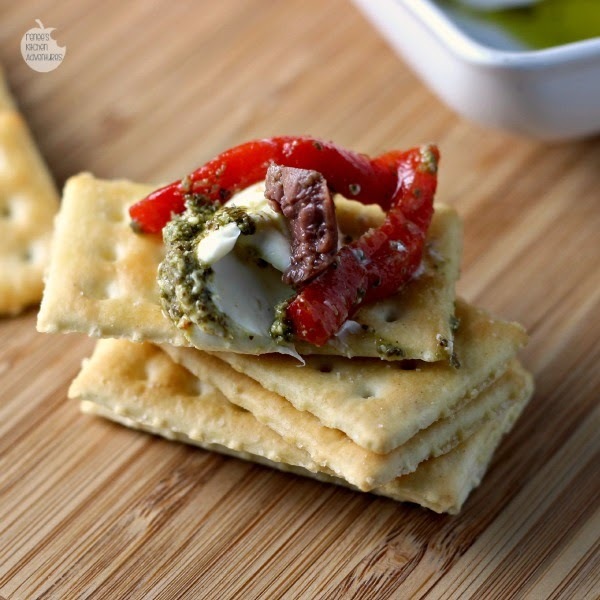 I like the modifications you made as well; the green pesto and red pepper strips make this look great for the holidays. I want to dive right into this dip-it's so festive!